Finally got to bed last night at a halfway sensible hour, after spending the previous two nights petrel-luring with BM and JLI. Used an old but powerful Yamaha amp and some beefy TDL speakers to really blast petrel noises out to sea. We’re 30m above sea level, so with a carrying south-easterly the sound should have made it a fair way out, despite some intermittent sea fog. Had made up a Storm Petrel cd with this in mind, and played it on repeat from 10.30pm through to 2am each night. 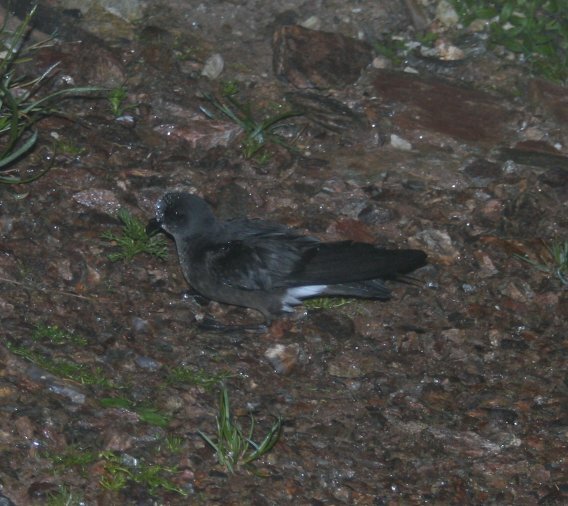 Wednesday night I was still in the house eating a late dinner when JLI came to the window – the first petrel had flown past them, and it was a large one… Legged it out, to see Storm Petrels now flitting around, but no sign of the big guy. Stuck on the Leach’s cd, which cleared the Storm Petrels immediately, but after half an hour of no birds, we went back to the Storm cd. Later on the Storm Petrels were incredibly confiding, coming right up to us and giving stunning views. With fog closing in, went down to the road, and looked back up to the croft. In the light of the moth-trap, you could see the petrels silhouetted against the white ‘room’ the light cast. Storm Petrels were like bats, small and moving through the air like the ash from newspaper on a bonfire. Then a different bird came by – noticeably bigger, and completely different flight action – like a small falcon. In the next 5 minutes it made a couple of passes at the edge of the light. Leach’s, surely? Meanwhile, have got some of the pallets up around what will be next year’s large potato and cabbage yard. Have put the sheep in there for now to graze it down to nothing, and will then give it a blast of Round-Up prior to starting to dig. Am aching just thinking about how long that will take. 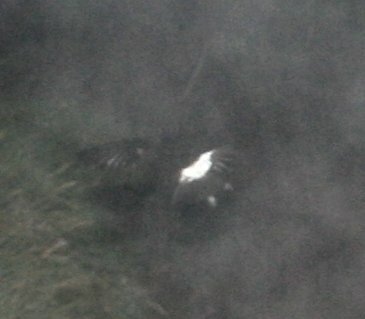 Finally, contender for worst bird photo ever taken. Ever. It’s a Storm Petrel in flight. In the dark. In the fog. Flying away from me. Etc.